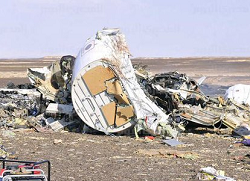 The Russian passenger plane that crashed in Egypt was brought down by a homemade bomb placed on board in a „terrorist“ act, the head of Russia’s FSB security service told President Vladimir Putin on Tuesday 2015-11-17. „According to our experts, a homemade explosive device equivalent to one kilogram of TNT went off onboard, which caused the plane to break up in the air, which explains why the fuselage was scattered over such a large territory. I can certainly say that this was a terrorist act,“ Alexander Bortnikov said. Islamic terrorist organisation ISIS claimed resposibility deliberately bringing down the tourist flight. According to russian investiagtors, the bomb which ISIS claimed to have been placed inside a „Schweppes“ can , that was deposited below a passenger seat at the left rear section of the passenger cabin either below seat 31A or seat 30A. 2015-11-07 PRESS CONFERENCE of the Egyptian Ministry of Transport and the Egyptian Air Accident Investigation Commission (EAAIC). Presented facts of the preliminary investigation after readout of both CVR and DFDR ‚black box‘ devices. It is too early to draw conclusions that an explosive deive was the cause of the crash. 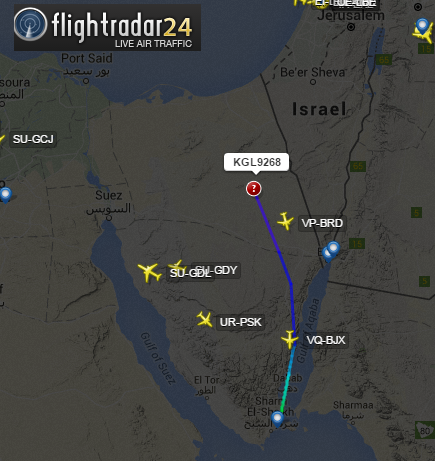 Metrojet flight 7k/KGL 9268 from Sharm El Sheikh to St. Petersburg disappeared from radar screens about 23 minutes after take-off. 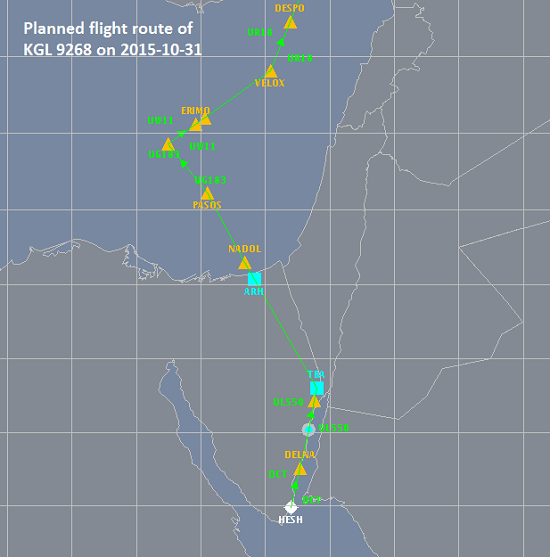 Flight 9268 took off from Sharm-el-Sheikh at 05:50:06L (03:50:06Z). 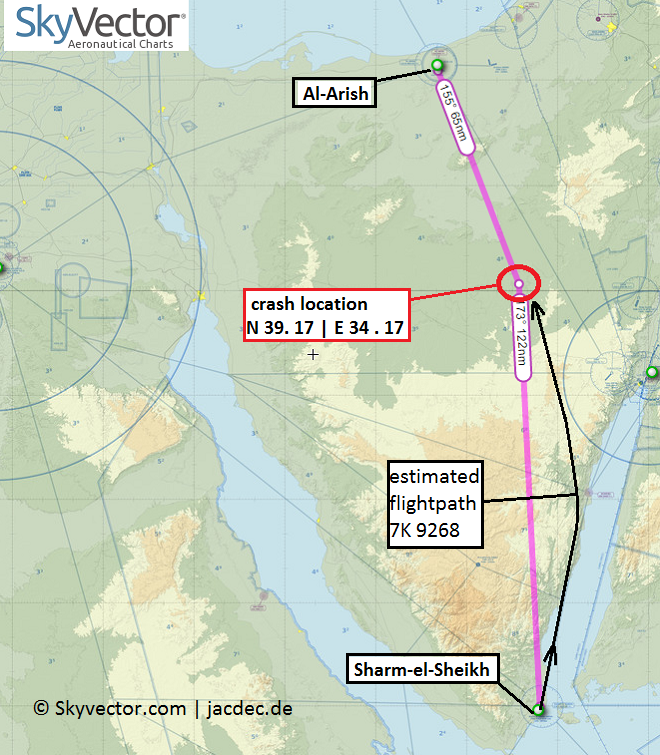 It climbed normally to join upper air-route R650 to fix DELNA, then via NUWEIBA, TABE where it was supposed to turn left joining air-route UL550 to fix EL ARISH and NADOL to PASOS in the mediterranean sea. The filed final cruising level was 36.000 ft (FL 360). About 23 minutes after take-off – when the A321 has reached an altitude of 30700 ft. – it suddenly disapppeared from radar screen. Last known position was N30.16min / E34 .17min. 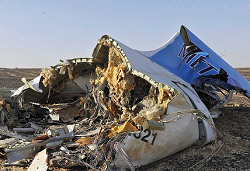 The wreckage was first spotted by alerted egyptian military jet pilots. Most of the wreckage was found completely burnt by post-impact fire. There were no survivors. 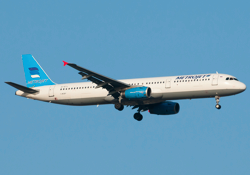 The Egyptian Aviation Ministry reported the pilots radioed a distress message indicating engine trouble and requested an immediate landing at the nearest airport. This was later denied, by saying that no mayday call or any emergency transmission was received by the crew. The wreckage was located close to the point of its last transponder transmission (when in a rapid descend at 28.000 feet), at coordinates 30.17 North + 34.17 East in a place called „The Valley of Darkness“(see map below). The wreckage is spread over an area of over 15 square kilometers (6 square miles) fueling speculation about an inflight breakup. Both CVR and DFDR ‚black-box‘ devices have been recovered and were taken to a laboratory for further examination. The investigation with multinational participants from Egypt (leading state of investigation), France (state of manufature), Russia (state of operator), Germany (state of production), Irland (state of registry) is ongoing. 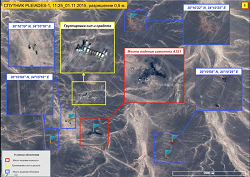 Unconfirmed video footage claimed to show the aircraft being shot down by ISIS forces has doubtful origin and there is no confirmation about its authenticity. Egyptians authorities have asked to stop traffic from flying over point PASOS. 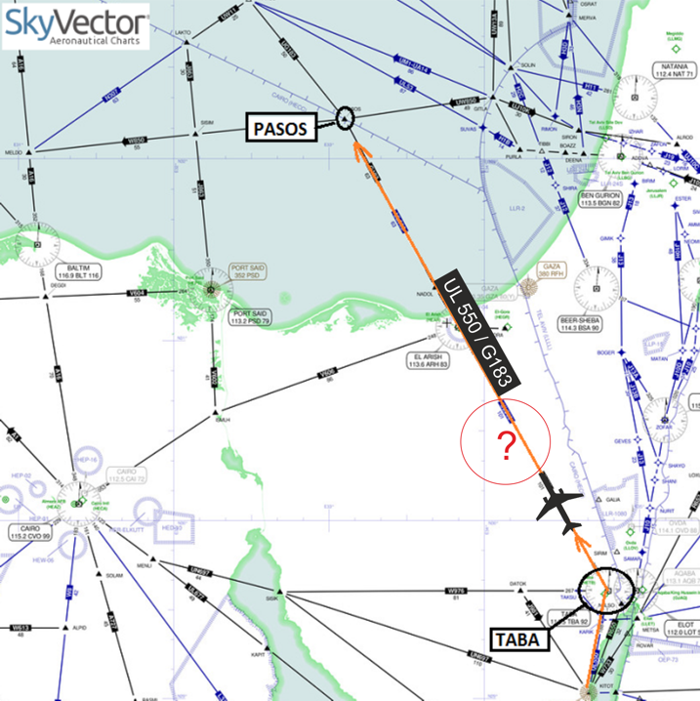 Therefore point PASOS in LCCC (Cyprus) FIR is not available for flight planning. FPLs filed via this point will be rejected by IFPS. Please re-file via points: LAKTO or RASDA. 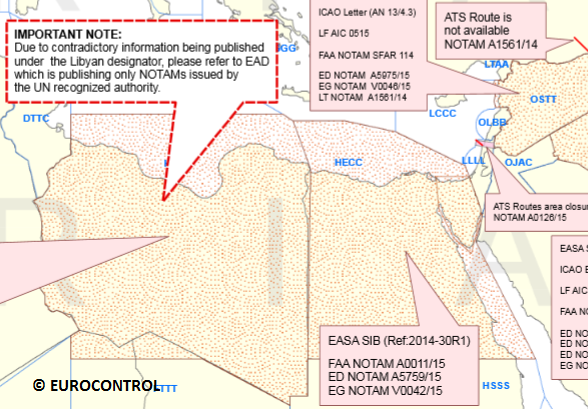 Still waiting for a HECC (Cairo ) NOTAM. 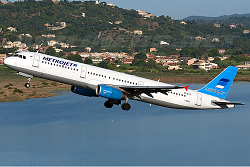 With immediate effect, russian federal transport authority Rostransnadzor issued an order that Metrojet (Kolavia) has to suspend all operations with the model Airbus A321 until a safety risk assessment cleared the airline of any safety deficits in their flight operations. Currently, the airline currently has four A321s in operation. 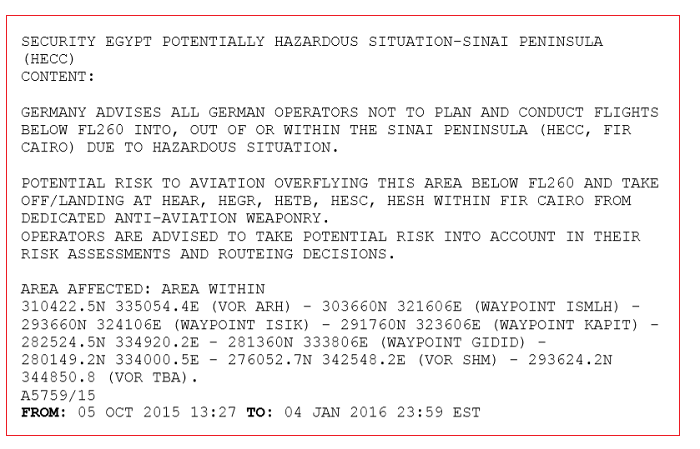 On Friday 2015-11-06 Russia ordered the suspension of all flights to Egypt with immediate effect. According to Russian a presidential report, undisclosed intelligence information indicates there is sufficient „evidence“ that an explosive device has been planted on board the Metrojet flight while being serviced at Sharm-el-Sheikh Airport. This was the cause for serious safety concerns to all flight from Egypt. Nordwind flight N4/NWS 1969 was in proximity of the aircraft in the minutes after the emergency of Metrojet flight 7K9268. 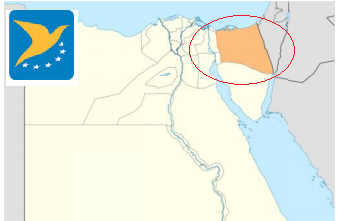 „Due to ongoing insurgent activity, operators of civil aircraft should be aware of the risk to flight operations safety in the North Sinai Governorate of Egypt deriving from possible use of small arms fire, rocket-propelled grenades, mortars and anti-aircraft fire, including shoulder-fired man-portable air defence systems (MANPADS).